Animation is not really my genre, but what I saw and read about this film, still made me want to see it. 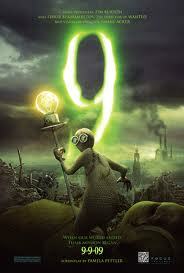 Inspite of the fact that Tim Burton produced this film and that it looks quite alright, I did not find “9” too interesting. A quite typical story playing in an apocalyptic future in which man lost the war with the machines, we follow a group of jute-dolls trying to survive. Fighting their mechanical foos with some semi-alchemical symbolism and sci-fi logic, a struggle develops with humour and drama. Not boring, but not too great either.